I could only imagine what it was like for you to watch your son die before I had my child. Now that I do have a beautiful baby girl I can't imagine the anguish it caused you. In eternity past you fellowshiped with him. He was beside you when you created the world and he held all things together. You watched his face as you told him what needed to be done on earth and that he was the one that would have to suffer in shame. You adoringly looked on as Mary-who was made pregnant by the Holy Spirit-grew carrying your precious son in her belly, your eyes filled with tears of joy as he was born and placed in swaddling clothes in a manger. You looked on with pride as he taught the religious leaders in the temple at age 12. And marveled at the man he had become when he fed the 5,000 and brought a dead girl back to life. Your heart broke as he pleaded and begged with tears of blood that you might take the cup from him. I have a confession to make: I love breakfast foods. One of my favorite indulgences growing up when I would go on trips with my church was sausage biscuits from McDonalds. Unfortunately I can't have sausage anymore, but my love for breakfast foods has not wavered. Something I have eaten on a handful of times is a quiche. I always loved it, but had never attempted to make it myself until recently. I made one for a clothing exchange party that I threw back in the fall. I felt that it fell short of my previous quiche experiences. It was soggy. Not just a little soggy, but that terrible wet, squishy texture that will haunt your dreams for nights after you had it...Okay, maybe not quite that bad, but it does seem to haunt your kitchen. There is nothing I hate more is soggy eggs. And I'm sure my friends were just being nice when they said it was good. 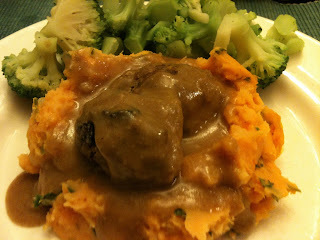 I have never been a huge fan of meatloaf...until I could no longer have your traditional meatloaf. For some reason ever since hamburger smothered in ketchup, mustard and Worcestershire sauce sounds better than it ever did before. So you can imagine, when I was watching Rachael Ray and saw her make meatloaf with horseradish mash and gravy my mouth began to water (and I don't even like horseradish!). I knew I wouldn't be able to replicate this recipe and stay true to my IC diet, but I could definitely tweak it here and there to make something delectable to satisfy my meatloaf craving. And this is what I came with....you know you want some.